Here are some words and pictures from previous Wild Campers customers. Scroll to the bottom of the page to see guests pictures. “I hired Sorley with my adult son. Neither of us had used a camper van before but we both found the van easy to drive. We were very happy with the quality and comfort of the van and its fittings. We used the satnav to help us find our way around and stayed on some beautiful wild camping sites. We took turns to sleep upstairs or downstairs, both beds were comfortable and cosy despite the chilly weather. We cooked and ate inside the van and found the cooking and sink arrangements to work well. “From start to finish Wild Campers was helpful & friendly. Communication throughout was excellent, useful & relaxed. Finn was a joy and had everything we needed for a great week exploring Scotland; sat nav with useful info programmed in, folder for everything you need to know about Finn (including top advise on making a cuppa in bed in the morning), fully equipped kitchen, pack of cards & wine glasses! Finn was reliable & added to the pleasure of exploring Scotland, we couldnt have asked for more. Wild Campers staff were relaxed, happy & genuine throughout. 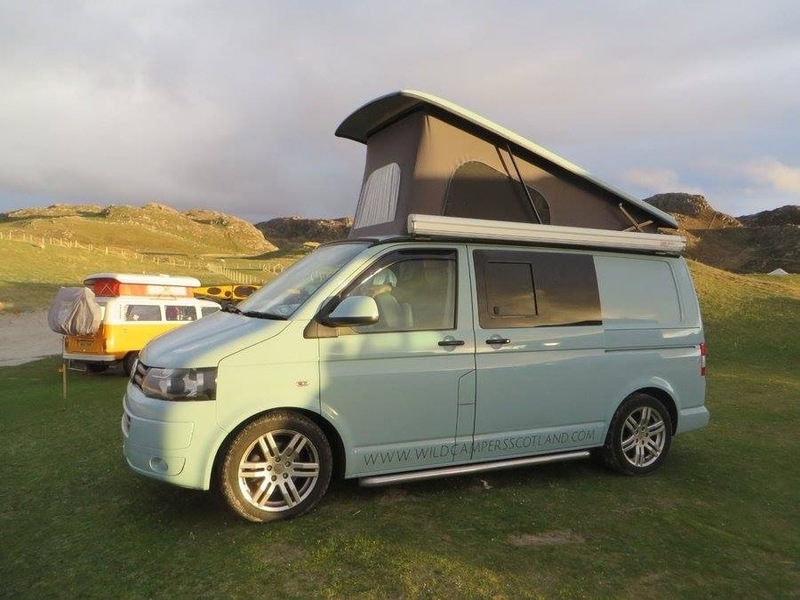 “It felt an absolute privilege to us to be allowed access to such a cherished VW camper van. Everything is executed to a very high standard. The carpentry inside is exquisite, with a specially designed place for absolutely everything – including the tea pot and the cafetiere. This meant there were hardly any rattles as we drove from place to place. Finn is very comfortable to drive, and the extra horses under the bonnet means it never feels under powered. Finn is much admired by many en route – with its distinctive colour and smart appearance. “We have just returned from a fantastic ten day holiday around the Cairngorms, the West coast and Mull in “Finn”. Scotland is beautiful, the weather was kind to us (we sea-swam – briefly – in April) and we absolutely loved the freedom, adventure and isolation that we got in the campervan. It was the first time that either of us had been on holiday together, let alone out in a campervan, and we were slightly worried about managing in the space. But you get used to living and cooking in it very quickly. Finn has been beautifully converted and all the equipment you need is slotted cleverly in the space and there is a reasonable sized fridge and storage space. You can sit around the table comfortably but you also have a different “garden” each day to sit out and eat in! Our favourites were the BBQ by the side of loch na keal (complete with a perfect West coast sunset), the lunch of fresh mussels picked up from a farm by the side of the road and cooked up in a bay next to a castle, and the breakfast in Carsaig with seals all around us.